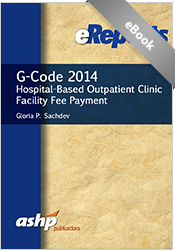 CMS released regulations associated with the 2014 Hospital Outpatient Prospective Payment System in a restructuring of facility fee billing that affects all hospital-based outpatient billing practices. Because the implementation of this fundamental change occurred so quickly, there is very little information availalable, despite the fact that for most clinical pharmacist services around the country, this CMS change will afford them an opportunity generate additional revenue. In this ASHP eReport, Gloria Sachdev, a nationally recognized expert, describes the change and provides the facts pharmacists will need to take advantage of the change in their own practice.